Colder weather will be blowing across the land for many of us soon, and for many pets as well as people, it will trigger some kind of depression. Many people confess to having the “winter blues” or the “winter blahs” when temperatures drop, but most don’t realize that their pets can be affected just as adversely during the winter months. What causes the winter blues? There are several culprits that are common to both people and their pets. What Causes the Winter Blues in Pets? The causes of cold weather depression are often the same for people and pets. Drops in temperature can naturally trigger a sort of “hibernation” response, causing pets to sleep more and be less inclined to go outside. If your dog or cat is a senior, the lower temperatures can also aggravate arthritis and joint pain. You may see your pet start to limp or move more slowly. They may also get up later in the morning and take a while to get warmed up before moving freely. 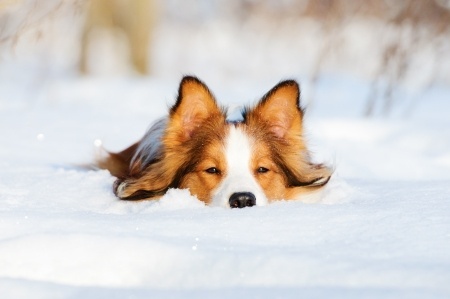 The shorter days and longer nights of winter can also contribute to your pet’s winter blues. Many dogs and cats who are used to being outside develop cabin fever, just like people. Because pets are getting less sunshine, they are also getting less Vitamin D, which is vital to sleeping well, protecting against heart disease and regulating mood. Pets living in the north probably aren’t getting enough D unless they spent sufficient time outside on sunny days. With the sun going down earlier in the day during colder months, many pets’ internal clocks adjust accordingly. Because it is nighttime outside for longer stretches of time, they may go to sleep earlier in the evenings. Boredom – many pets with winter blues become destructive simply because they aren’t getting enough sunlight and outdoor exercise. Eating changes – either eating more or eating less – can indicate your pets have the winter blues. They may be overeating out of boredom or not eating enough because they feel lethargic and sad without knowing why. Compulsive or repetitive behaviors such as constantly barking or repeatedly doing the same thing over and over are often signs the winter blues in pets. If your dog is usually a good companion but has become hyper-vigilant or overprotective during colder months, he may be getting rid of his excess energy by being more aggressive, which isn’t a good thing. Loss of interest in indoor activities your pet usually loves may mean your pets’ winter blues are affecting his mood. If you suspect your dog or cat is suffering from the winter blahs, first have them checked by a veterinarian to make sure there isn’t an underlying health problem. If it is winter depression, you can work with your pet to overcome the feeling of being down and bored. If your pet is bored and seems to be losing interest in his food, consider investing in a few inexpensive feeding tools that will require him to root around or solve puzzles in order to get to his food. This will stimulate his appetite and give him a chance to put his brain to good use. Develop games you can play with your pet inside the house. Play fetch with soft toys rather than tennis balls or hard toys so that you can play in any room in the house without worrying about knocking over lamps. Hide and seek can be great fun for both you and your pet and will get your metabolisms working. The brighter the light, the happier your pet will be during the winter. Open the curtains and let some sunshine in and keep rooms brightly lit during the day and into the evening so that the early setting of the sun won’t leave them pining for summer. If your dog or cat is less active during colder weather, cut back on their food so that they don’t gain unneeded weight and end up feeling sluggish. Take the time to teach your pet some new tricks they can show off when company comes or when they are able to leave the house. Stimulating their brain and giving them something new and interesting to focus on will give them a mental workout. Don’t let your own case of the winter blahs affect your pets. If you have cabin fever or are feeling restless and bored, bundle up and take some time to play in the snow with your pet. You’ll both feel better after some exertion. If after you’ve tried everything your pet still seems depressed, talk to a veterinarian again. Depression in animals is a very real thing and you’ll want to treat it as soon as possible so that both you and your pet can enjoy the winter months despite the colder temperatures. I never really thought about the winter time also affecting our dog, but as he came from the south and we live in the Midwest, I am sure it affects him too. I definitely want to try the puzzles I have seen everywhere for dogs. Our boy is best when he is stimulated. Thanks for sharing! Hmm I know pets can experience grief however winter blues I never really thought about. It actually makes sense though. If you are used to daily walks multiple times a day and then can’t get out as much in winter, you’d go stir crazy too. I did notice when my cats were alive that they would be eager to play more when it was cold and also appreciated when I pulled the curtains back to let the bright sunlight in. They love a window perch…although not for lengthy times when frost is on the windows! These are great suggestions to keep our pets active during the winter. I don’t think many people think their pets can get winter blues, but it makes sense with the days getting shorter. 1) Setting upon agility course in the apartment using soup cans, and other household items. 2) STAIRS! we live on the 9th floor … so we take the elevator down (too hard on tiny knees) and then walk back up. It’s good for all involved! 3) Sniff games. I have three tiny little boxes. I hide his favourite toy in one and then we play the “find the box” game. He’s not food driven so … the toy works. 4) Ball and fetch. He doesn’t fetch anywhere else … but in the common hallway of our floor. Lucky for us the neighbours don’t mind. So I get the small foam cat soccer ball and we go at it for a while. 5) We are SO lucky to have a coffee shop that allows pets inside. EVERYONE loves when we show up. How interesting I never really thought about pets getting the blues. Of course I know how lack of sunshine can affect us and many need a sad lamp to help, but didn’t realise how the weather could impact our dogs. Great tips thanks so much for making us aware. I had no idea that animals could get the winter blues but this makes complete sense to me now. Great suggestions, and I’m trying to incorporate more puzzles into the boys routine. Although, to be fair Gonzo absolutely LOVES winter and playing in the snow. He spends more time outside because the ground is frozen and he can’t dig- so he “hunts” the birds, squirrels and chipmunks, and deer on the deer path behind our house. Lots of interesting smells! I think our Lyla was starting to get the blues a little but we did a few of the things you suggested and they worked! One thing we also did was took her on an extra car ride each week. She usually gets only one, on Sunday’s. The extra ride seemed to perk her up along with other things as you suggested above. I have never thought about the winter blues for pets so thanks for the eye opener and great post, am going to put my thinking cap on about this and how to keep her more busy indoors. Well I live in Florida so we really don’t believe in winter here but my dog really likes the colder weather she can run her roomies forever and ever without it being too hot and getting too tired. But I think with the time change and the days ending earlier she is sleeping more like you mentioned so I just have to make sure she’s getting in enough exercise earlier in the day. I know I get the winter blues, but never thought about our dogs getting it too. Even in the winter, I make sure we take our daily walks, but they are usually much shorter since it’s too cold to stay out that long. So we play games inside a lot too. Great tips, I think getting out in the early morning winter sunshine is great for the body clock for both humans and dogs. I definitely need to think of some indoor games for those grey drizzly days we get in London! Very interesting post and great tips. We are in Ontario and the temperature today is minus 14 degrees – feeling like minus 20 (or less) with the wind chill. That’s Celsius! 1.4 Fahrenheit! It is dark when I leave for work and by the time I get home it is already dark again. Since the dogs have been on their own most of the day – with the exception of a quick pee break from the dog visitor, they are experiencing cabin fever. I play hide and seek and other games with them and of course, fetch, fetch, fetch with Reese. We make the most of our weekends with the pack (and bundle up warmly). We have a lot of big trees in our yard. In the summer, our house is cooled by the shade, but it is also pretty dark inside. I love the bright light in the winter, especially when we have snow. I think a lot of people in my area suffer from lack of sunlight, and I can see how pets would too. Informative article! As pretty as winter can be, it certainly can cause the blues. Our new house has a large bay window through which the sun streams most days. Our cats often congregate near it. Our new house also has a finished basement, where we have set up agility equipment, and all the pets enjoy playing there daily. When weather allows, my dog and I also take walks. I’ll try some of your other ideas too! The winter blues are not an issue in this household since Gusto and I both love to play in the snow. I prefer to take him out on cloudy days or walk in the woods so he doesn’t get blinded by the reflection off of the snow though. I wonder if he would wear tinted googles…. I usually suggest owners of young dogs take an obedience class during the winter. At least one night during the week your pup will get worn out. Also then you’ll have the training to work on during the week and be motivated to do so. As long as the weather isn’t too bad (icy sidewalks or deep snow), I usually like to take long walks, although this winter Buffy is protesting since she is older (almost 9) and is my only dog right now, so I’ve been playing ball inside a lot. What a great post! I definitely have some winter blues – especially when it is cloudy and gets dark early. I never even considered that Ruby and Rosie might also be experiencing some blues. Ruby definitely gets some winter stiffness and doesn’t want to go out as much in the winter months. I will keep an eye out for other symptoms. Love the indoor activity suggestions. I’m going to share this post on Pinterest and Twitter. Lots of good information! I, fortunately or unfortunately, depending on how you look at it, live in Florida so this doesn’t effect us as much. But, that being said, I love the winter and I miss the snow!